The Tramway is located in the south side of Glasgow, and is regarded as one of the best contemporary visual and performing arts venues in the UK. The building has some very distinctive architecture, arising from its origins as a tramshed in 1893, and it has changed hands several times since then. For some years after Glasgow's trams ceased in the 1960s, it served as Glasgow's Museum of Transport, before the Museum moved to its present location in the Kelvin Hall. The Tramway was developed in time for use as part of Glasgow's celebration of the European City of Culture in 1990. 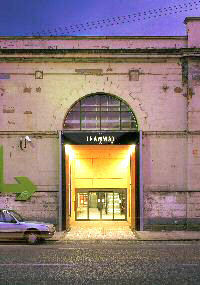 In addition to their wide programme of exhibitions, theatre, performance and experimental art, the Glasgow Tramway theatre runs regular workshops with schools and Glasgow's creative community. The Tramway Theatre also has a cafe / restaurant, and just behind the Theatre lie the Hidden Gardens, a peaceful, inspiring haven. The unique Hidden Gardens has developed with a range of plants significant to different cultures and belief systems, and this international attitude is reflected in the range of events and performances staged there.